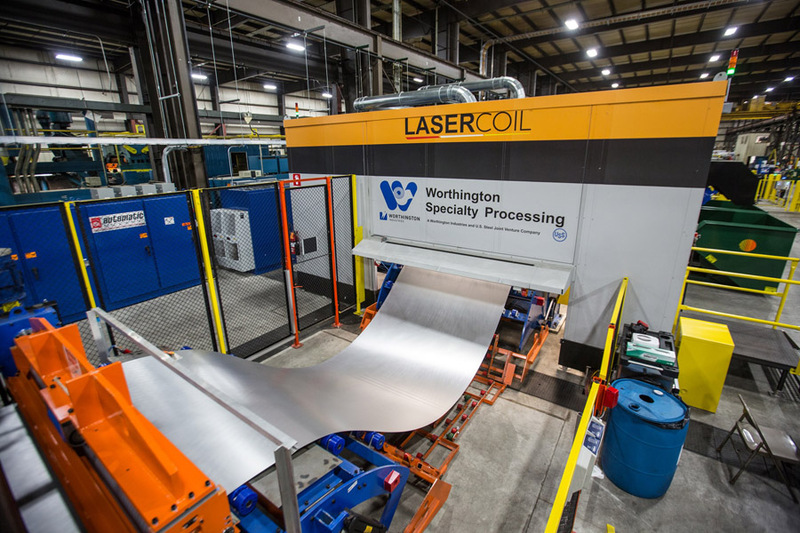 Laser blanking from continuous-fed coil stock is starting to make its mark in high-production environments. With new systems accommodating 8-kW lasers, any company processing multiple materials and a high mix of models needs to seriously consider laser blanking as an alternative to stamping. These systems provide flexibility in a multitude of ways, such as the ability to achieve quick changeover as no hard tooling is required, the ability to cut a variety of material as lasers are material agnostic and the ability of lasers to cut any variety of complex shapes, to name just a few. If you are considering a move to laser blanking, here are some system features to consider to get a solution that delivers on all of your expectations. When coil-fed laser blanking systems first entered the market, there was a lot of focus on the ability to feed material in a continuous (on-the-fly) mode to attain high speeds. Therefore, machine builders focused on this attribute. However, our experience has taught us that not all parts run faster in continuous mode. Depending upon the contour of the part, 15 to 20 percent of parts can actually run faster in feed index mode. So, it’s good to have a system that provides the flexibility for you to choose your feed style. 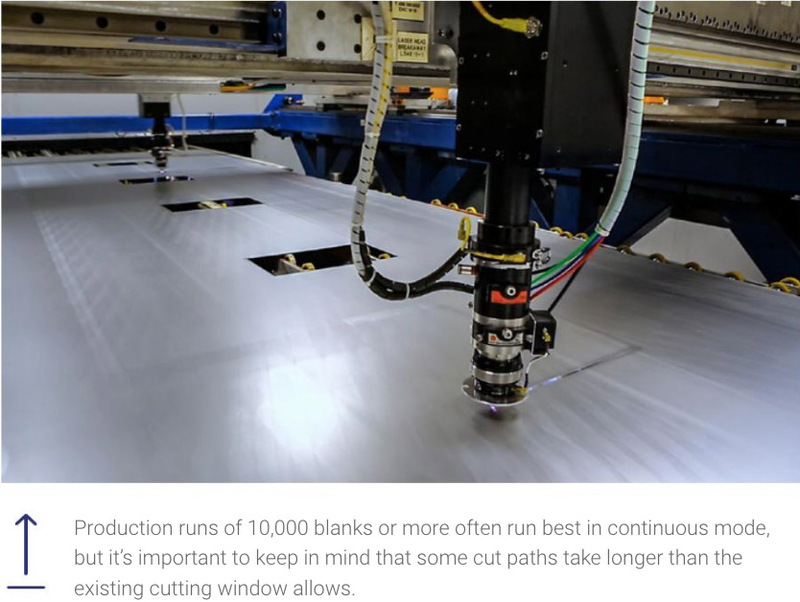 It’s true that most production runs of 10,000 blanks and higher run best in continuous mode but, in some instances, the length of a single cut path can take longer than the existing cutting window allows at the faster production rate of continuous feed. So, rather than split the cuts between the heads, index mode allows the user to choose a mode where the cut can be completed prior to indexing the material. 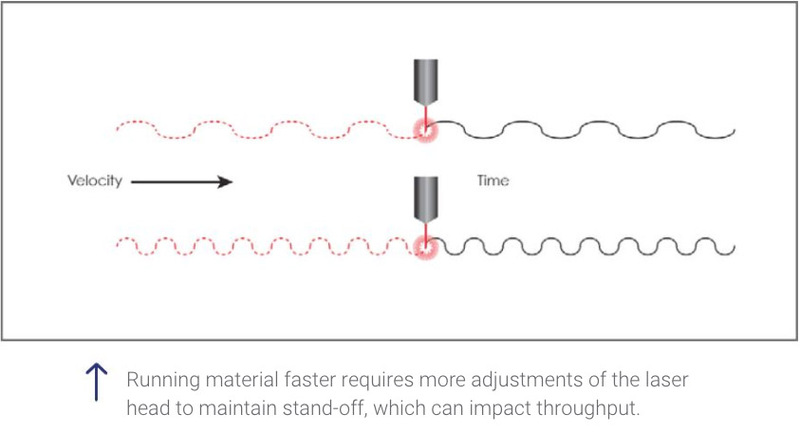 Additionally, keep in mind that programming for continuous mode requires time to optimize the incorporation of the motion of the strip with the feeder. With a short run of parts – say 1,000 pieces – it wouldn’t be worth investing in that optimization time. You’re better off going with feed index mode, which is much simpler to program. In the long run you might be sacrificing some actual production time, but in the overall scheme of things you’d be delivering the parts sooner by eliminating complicated programming time. Gravity shedding of scrap and lightweight agile material support can help improve laser blanking system speeds. 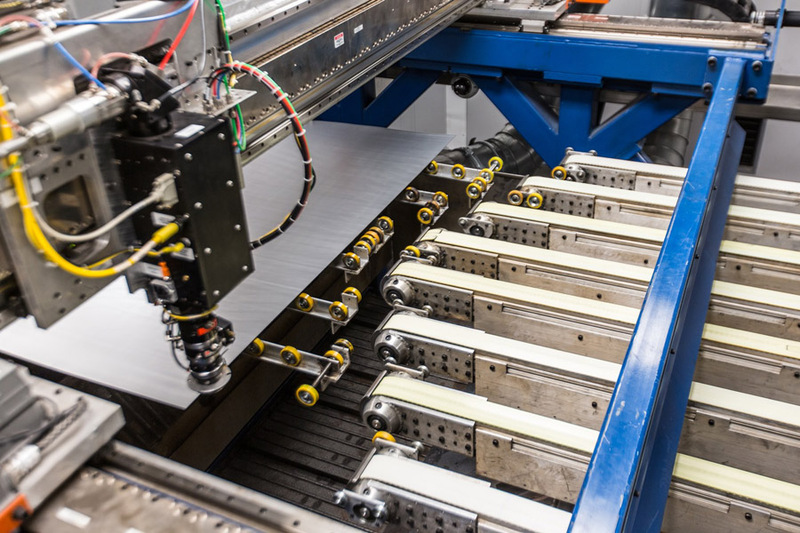 With programming software advancements, laser cutting offers great potential for cost savings through the ability to maximize raw material usage and reduce scrap. CAD information can now be used to create both a nesting pattern that maximizes material usage and a corresponding cutting path routine to operate the laser cutting system. However, it’s important to have software that is easy to use and that best works to your purposes. Some systems, such as LaserCoil Technologies LLC’s, come with modern CAM tools that make easy work of part orientation, common line cutting, nesting and determination of the correct laser parameters. Also, if you need to get a good handle on real time required for scheduling planning, then it’s important to ask if your supplier can simulate cycle time prior to actual production. 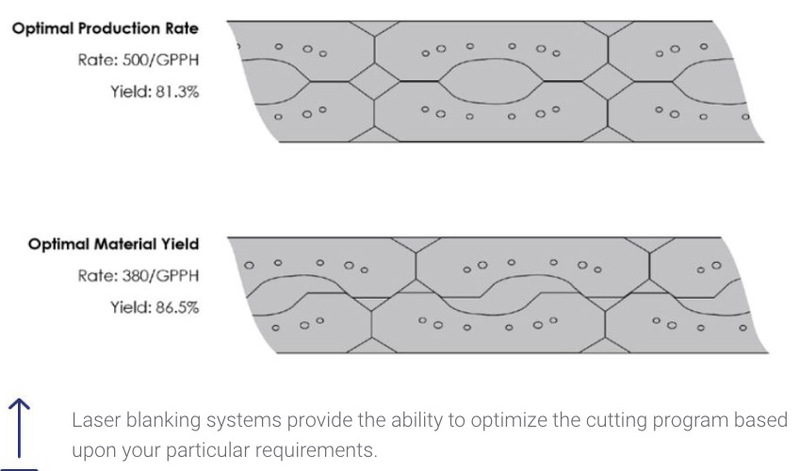 Simulations cannot only determine your potential cycle time, but can also optimize your cutting program to achieve your requirements, be it throughput or material yield. For example, if you’re most interested in parts out the door, then you can select a nesting pattern that optimizes the cutting speed, which may not be the best use of material. On the other hand, if material usage is your number one requirement, the production rate can be slowed down to achieve the most optimal nesting pattern. The flexibility within the LaserCoil software allows you to ask for what you want, such as “nest-based upon in-stock coils,” “nest for best material yield,” “select best coil width for best yield,” and so on. Yet, the programming simplicity means you don’t need a skilled technician to operate it – just import the CAD files, plug in your parameters and the software does most of the rest. Ensure that any software you choose has the ability to consider grain constraint, multiple laser heads and peripheral automation. As mentioned, a great feature of laser systems is the ability to maximize raw material usage and to reduce scrap costs. However, if “parts out the door” is your goal, then you should look for a system that doesn’t add in extra steps for scrap handling. For example, LaserCoil systems feature a series of dynamic profile conveyor lanes that independently and dynamically reposition to maintain a clear path below the moving laser head. These systems are also able to automatically shed scrap during the cutting process. Scrap falls to the bottom of the machine where it is conveyed to a scrap bin or shed to a scrap system. This approach delivers burr-free, ready-to-stack parts at the end of the line without impacting production time. Stacking capability is related to the scrap removal process. If the system does not remove scrap prior to the end of the line, then you are limited to robotic stacking where the robot picks the finished parts out of the coil strip, leaving the scrap on the conveyor to be collected at the end of the line. This requires time, slowing down your throughput, and, of course, requires dedicated tooling for the robots. Related to the above scrap removal approach is that fact that many coil-fed systems require special coil feed and/or special stacking solutions, limiting your ability to choose your own suppliers. There are systems out there, however, such as LaserCoil’s, with simple interfaces that can work with traditional feed and stacking equipment or can even be retrofitted to existing press feeding lines whether using side- or end-of-line stacking. In that instance, you can even start with a manual stacking process and then expand later to fit your changing production needs. 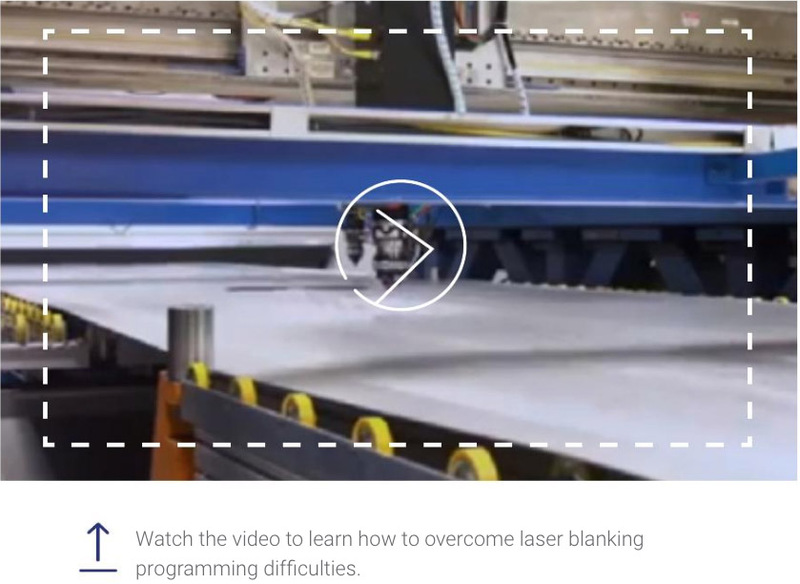 To optimize the capability of your laser blanking system, there are some considerations for reaching your goals. First thing you’ll hear about is the total system power. However, how is the power being calculated? One system may have a total power of 12 kW delivered by three 4-kW laser heads whereas another system may achieve it through two 6-kW lasers. Which one is the best for you really depends upon your application and whether the laser cutting window provides enough time to achieve your cut. The good news is that laser blankers can accommodate multiple heads for a shared balancing of the workload, helping to achieve faster processing speeds and improve productivity. However, to really gain the most from multi-head systems, you want to ensure that each head can cut independently of the other versus being tied together and limited to mirror-image cutting contours. This capability will increase both your flexibility and your speed. Another design element that can affect the system speed is the dynamic material support. These conveying systems need to be able to react and adjust quickly so as to not limit the overall systems’ cutting speed. Basic physics teaches that the higher the mass, the more energy it takes to move it. So look for a system that can provide agility. Another area to look at is how the system maintains stand-off (the distance between the laser cutting head and the material), which is critical to clean and consistent cutting. All laser systems employ capacitor sensors for receiving input on material variations, but feedback devices can vary, adding slight delays to the process. And, the faster you run the material means there are more adjustments to be made over a shorter period. These adjustments may only take milliseconds, but in a high-production environment, these add up to meaningful time. In the LaserCoil system design, a proprietary linear motor Z-axis is now integrated directly into the laser head whereas this used to have its own independent controller. This means the system automatically and independently maintains stand-off as it encounters material variations along its cutting path, with a state-of-the-art response time. Last but not least to consider are space constraints. There is no doubt that these systems require some real estate. But, as mentioned earlier, if you can gain some flexibility in your press feeding and stacking choices, you may be able to reduce the overall footprint required. 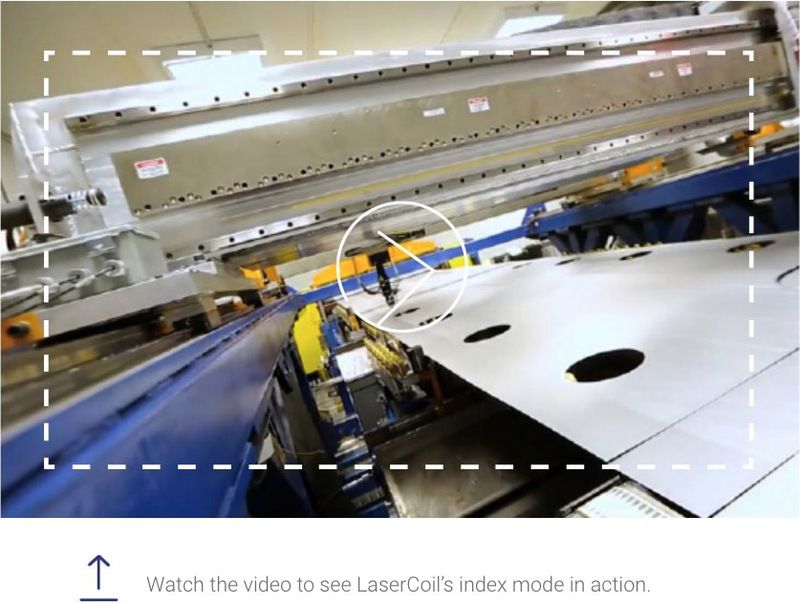 As a frame of reference, the system at LaserCoil’s technical center, which features traditional coil feeding equipment and manual stacking, is about 90 sq. ft. by 45 sq. ft. Obviously, each system size is variable, depending upon items such as number of laser heads, size of parts being run, type of stacking, etc. With the recent progress made in system designs, laser cutting from coil stock should be considered as a viable manufacturing solution for anyone producing blanks into the 100,000 range. And, this is especially true if you have challenges in running advanced materials, complex shapes or delivery issues. But, all laser systems are not created equal, so make sure you do your due diligence to ensure your laser system delivers all the benefits you anticipate from this game-changing technology.